The most important part of your home during the winter? Your furnace. It is vital to the safety and comfort of your family throughout the holiday season. Without it, you would be left to deal with below freezing temperatures day in and day out. That is not how you want to spend your winter! The reality is that cold weather is on the way – and in some cases, already here. This makes it especially important to take good care for your furnace. Not sure how to do it? Don’t know where to begin? This is everything you need to know about caring for your furnace during the cold winter months. Start by heading downstairs to take a look at your furnace. Newer furnace models tend to have flashing lights that indicate potential problems or issues. Older furnaces on the other hand, do not. If you see a flashing light, take note. This will give you a good indication of the problem – which you should let a professional know about right away. That will give them a better idea of where to start (and what tools to bring) when they come to inspect your furnace. Whether you see a light flashing or have no idea if there is a problem with your heating system, the result is the same. Start by bringing in a professional heating contractor. A professional inspection should be performed at the beginning of the season…but if you haven’t scheduled your visit yet, now is the time to do so. 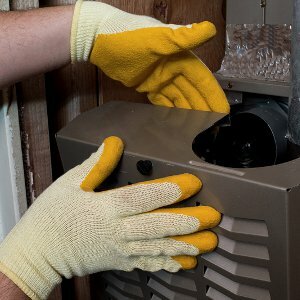 This will ensure that your furnace will continue to work effectively throughout the winter. That means a lower risk of emergency repairs and a heating system that is consistent all season long. What will a qualified heating contractor do to make this happen? They will take a good look at your heating system to make sure it is ready to deal with the demands of those harsh winter months. The heating contractor will check everything from your furnace to furnace air filters, the thermostat, the registers, and the fan. This thorough inspection is essential. Why? Every part of your heating system needs to work effectively. That means all of the parts must be in good working condition. It also means that warm air must be able to flow through each room with ease. An inspection will ensure the parts are working properly and the air can flow through effectively. Something else you can expect? The heating contractor you choose may also take a quick look at your ductwork to check up on potential air leaks that could be costing you money. In addition to bringing in a professional you can care for your furnace in another important way. Change your furnace air filter every month or two. How often this needs to be done will vary based on certain environmental factors. However, during the winter months, sooner is better. The furnace pushes more air through the filters when the weather outside is cold. That can cause them to become clogged much faster than usual…. so inspect your filter once a month and change it as necessary. Taking care of your heating system is essential. With a little professional help – and remembering to pay attention to your furnace filters – your heating system should work well throughout the season. A bit of TLC can go a long way towards improving your home.